You've applied, you've checked out financial aid, you've met with an advisor and registered for classes. What's next? Make sure you know which campus or campuses your classes are on. CNM has seven sites in central New Mexico. Figure out which buildings your classes are in. You'll need a student ID card to use library services, tutoring or computer labs. You can get your ID at the Student Activities Office. 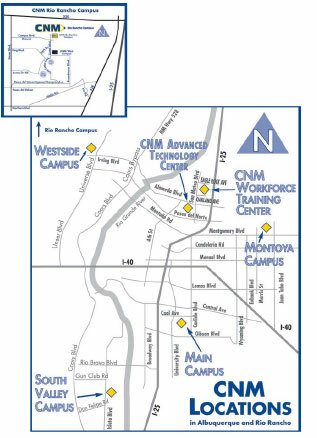 You must register your vehicle to park on any CNM campus, even where the parking is free. Plan to arrive early because parking spaces can be hard to find. You can't be a college student without college textbooks. Get them at the CNM Bookstores or find them where you can, but find the right ones, find them early and plan to work them hard. Great places to study, with helpful staff, tons of books and loads of essential resources, your CNM libraries are equipped to help you learn in comfort and style. A virtual learning environment and course management system, CNM Learn extends the classroom and classroom hours by letting you access Email, Discussion, Assignments, and Assessments whenever you like and wherever you have an Internet connection. Use your CNM student account to login at any of CNM's 14 Open Computer Labs and put a full-access desktop computer to work for you. Check availability ahead of time at this cool page: http://labmaps.cnm.edu. A Glossary of terms for CNM.